Overview: JM Bullion is a Dallas based company that started its operation in 2011 and since then, it has expanded its products portfolio significantly. Today, the company offers precious metal bars, coins, bullets, rounds, and other IRA-eligible asset types. Editor’s Note: We believe JM Bullion composite star rating is artificially low because of the company’s lack of engagement with BCA & TrustLink consumer advocacy sites. The company, which was established by two entrepreneurs named Jonathan and Michael, has experienced high growth rates over the past five years due to its commitment to investor-friendly services and high-quality products. The user-friendly, responsive website and extensive range of products are indicative of company’s passion to lead the market. JM Bullion can rightly be called a full-service company. The company offers a wide selection of precious metal assets at market-competitive prices. In addition to this, the company provides fast free shipping and purportedly excellent customer service. Free shipping (for orders $500 or above) is also a major attraction for customers as there are not many companies that offer free shipping on online purchases. As already mentioned, the company offers a wide selection of copper, gold, palladium, platinum, and silver products. JM Bullion doesn’t maintain a dedicated ‘Resources’ section. The information is fragmented among several pages, including charts, FAQs, and IRA Program. The FAQs section contains all information related to pricing, shipment, payment, and returns. The IRA Program contains a step-by-step guide on how to open a self-directed IRA account and information on IRA-approved precious metals purchases and JM Bullion’s preferred self directed IRA custodians. 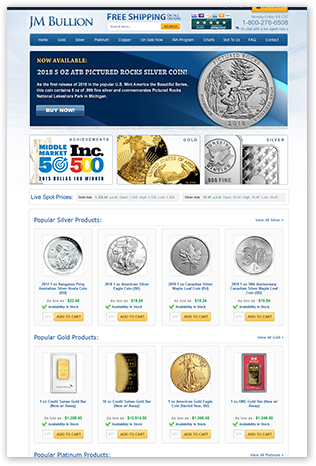 The ‘Charts’ page contains live price charts for gold and silver, platinum, and Bitcoin. There is also a handy spot price widget on the homepage and a bullion “app” for your smartphone. We were not able to located a live chat feature, a favorite of ours for quick question and answer getting. Click to see how JM Bullion stacks up against the best gold companies! The JM Bullion online official website looks clean and sorted. With minimum use of graphics, the website looks clutter-free and well-organized. The top navigation bar does now contain dropdown menus, lacking in our initial review of the site. That has helped lower the difficulty for first-time users to access deeper pages of the site with fewer clicks. Also, as already mentioned, the information is segregated among different pages, which may make it a hassle for the visitor to gather all the required information they need. The product pages are well-designed. Each product is accompanied with its image and three tabs – product details, specifications, and shipping FAQs. The right hand sidebar contains customer service JM Bullion reviews specific to their products. There is another page titled ‘On Sale Now’ which features discounted products of various sorts. The website contains links to the Facebook and Twitter profiles of the company. With over 1,800 followers on Twitter and 26k likes on Facebook, the company has a strong online presence. We also scrolled through the Facebook timeline to witness that JM Bullion actively replies to all customers’ comments. Shipping over 30,000 orders every month, JM Bullion has become one of the reputable online metals retailers. The company holds and an A+ ranking from Better Business Bureau (BBB) for being a customer service oriented business. Fast, cheap shipping and market-leading prices are the two main strength areas of the company. However, the company needs to work on its website, add more content to it, and make it more engaging and responsive. In addition to this, the company currently ships to US addresses only. Improving terms for international shipping and offering more payment options can also help the company win more customers and further improve its trust rankings. Particularly if you live in the Dallas Tx area, buying from JM Bullion and using them as a go-to local dealer / metal retailer, could make you a happy customer.